Apollo 12 moonwalker Alan Bean, seen both in photography and his own artwork standing on the moon. Bean died on May 26, 2018, at the age of 86. Dean Robbins is a journalist and children's author. "The Astronaut Who Painted the Moon: The True Story of Alan Bean" (Scholastic) will be published in June 2019. Robbins contributed this article to Space.com's Expert Voices: Op-Ed & Insights. Alan Bean was the only artist to travel to the moon. While other astronauts brought back lunar rocks and soil, he brought back a visual interpretation. Bean died on May 26, at 86, almost 50 years after becoming the fourth person to walk on the moon during the Apollo 12 mission. He returned to space with Skylab but left NASA in 1981 to pursue his second love: painting. He toiled over Impressionist-style canvases picturing the lunar surface, astronauts in action, and Earth from 240,000 miles (386,000 kilometers) away — not as they look in photographs, but as they looked through one man's eyes. From a young age, he was obsessed with both flying and image-making. His parents obligingly drove him to the airport in Fort Worth, Texas, so he could watch planes take off and land. They also fed his hunger for books and magazines about World War II aircraft. Bean paid special attention to how his favorite models looked, with their intriguing shapes, stripes and symbols. He created balsa versions to hang in his bedroom, gazing at them longingly before sleep. Bean was only a teenager when he learned how to fly. He went on to become a Navy test pilot in the late 1950s, then an astronaut trainee in the early 1960s. While spinning in a NASA centrifuge by day, he began taking watercolor classes at night. This preoccupation distinguished him from other astronauts, who tended toward golfing and hunting in their spare time. Bean's artistic eye gave him a unique appreciation of his trip to the moon in November 1969. As he bounced on the lunar surface, he tuned into the bright sunlight, the inky shadows and a sky that reminded him of shiny black patent leather. He was moved by the sight of Earth from that vantage point: a radiant blue-and-white marble suspended in nothingness. Back on terra firma, Bean yearned to communicate these wonders as only an artist could. And he applied himself to the task with the same rigor he'd brought to his astronaut training. Befitting his background as an engineer, Alan Bean the rationalist started with a scientific approach. He created a model of the moon's surface and the lunar module, with figures representing himself and fellow moonwalker Pete Conrad. A klieg light stood in for the sun. NASA portrait of astronaut Alan Bean, who walked on the moon during the Apollo 12 mission in 1969. After measuring the angles and shadows, Alan Bean the artist took over. Yes, he rendered proportions accurately on his canvas, but he also applied color like a Space Age Monet. In his hands, outer space is not the black and gray wasteland you see in photographs. It's a dazzling vision as witnessed by an awestruck earthling, with reds suggesting the moon's heat, yellows and oranges the sunlight falling across acres of rock. Bean went a step further to connect viewers with his experience of outer space. He sprinkled his paintings with dust from his astronaut gear, scarred them with lunar tools and even stamped them with heavy space boots. With these expressionist techniques, he rendered the moon — both the object and the idea — as no artist ever had. Bean pursued this taxing work to the end of his life. Why didn't he simply rest on his laurels as one of 12 humans to set foot on the lunar surface? I learned the answer while collaborating with him on the children's picture book "The Astronaut Who Painted the Moon: The True Story of Alan Bean." At his age, Alan needn't have bothered with this project. But he threw himself into it, fact-checking my text and contributing examples of his paintings. It mattered that much to speak to a new generation — one that hadn't followed Apollo 12 on a blurry black-and-white TV set, as I had. Alan was passionate about showing today's elementary school children what he saw on his fantastic voyage beyond Earth's orbit. There's only one word for such a person: an artist. Dean Robbins is a journalist and children's author. 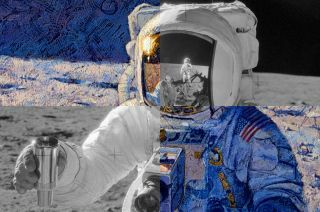 "The Astronaut Who Painted the Moon: The True Story of Alan Bean" (Scholastic) will be published in June 2019.